I never thought i’d be so excited by a picture of a digger, but I am. 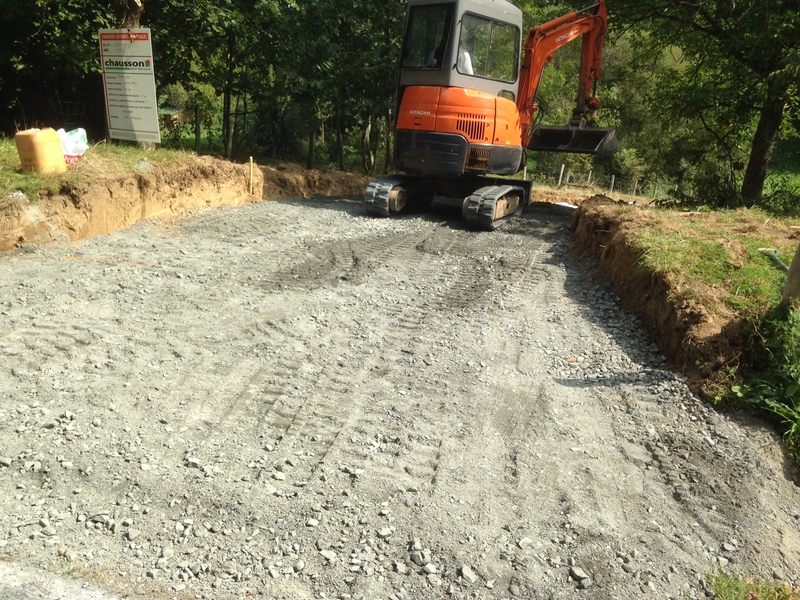 The picture above shows a digger on our site, starting work on the access road. Stuart from SLM Construction kindly sent these through so that we could see his progress. It night not look like much at the moment, but it is the first sign that we have that work has started and that we really are building a house! The building of the foundations should take about 6 weeks and then the timber frame can start – just as long as we finalise the designs! We will be signing the contract with Marandat next week, so we need to stop tinkering soon! The sign to the left of the picture must be displayed as part of the planning process and is therefore a legal requirement. Unfortunately, for the first two months that it is displayed our planning permission can be contested by third parties. Hopefully, this will not happen, but I will have my fingers crossed until mid-November! The photo of the sign is just as important as seeing the digger. If we did not have this sign in place, and the proper form, potential opponents would have the right to contest the planning decision. The obligation to prove that the notice was placed on the site in a correct manner, and for a sufficiently long duration, lies with Tom and I – so hooray for the photo as proof. We wrote to Grand Designs about our project but unfortunately they are only covering projects in the UK. They only ever did one season of Grand Designs Abroad and I think they should think about doing another one! Now that we’ve started on site, more posts and photos should appear, keep you eye, we’ll keep you updated as much as possible! Casque de chantier – Hard hat. Categories: Construction, French Planning, House Construction, Montemboeuf Plot | Tags: Diggers, foundations, French Planning Regulations, Planning Permission, SLM construction | Permalink. 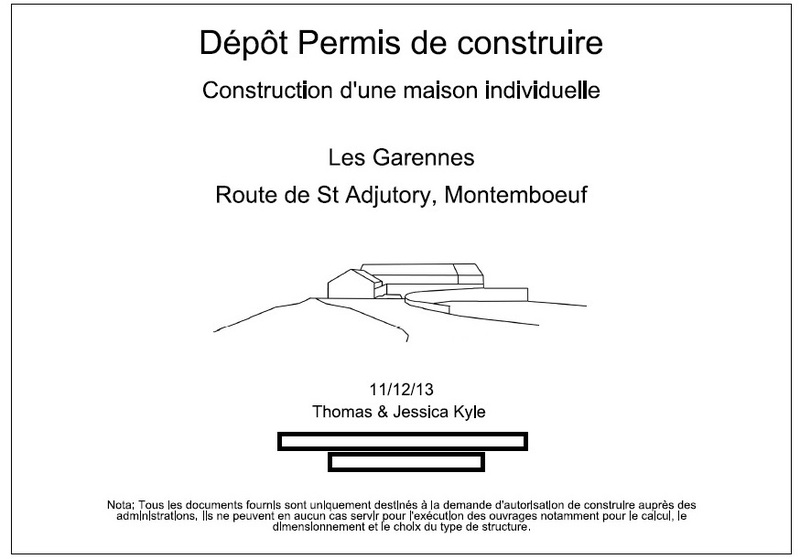 Over the last couple of months Tom has been working hard to get the planning documents together to send to the Mairie in Montemboeuf. Having never put in a planning application in to UK planners before I am not sure how much more onerous this process was – other than the fact it all had to be in French! Our Planning Application is finally in! In January 2013, the French introduced new energy efficiency regulations called Réglementation Thermique 2012 (RT2012) so we had to submit a declaration (attestation) that our proposed works comply with RT2012. Thankfully, we know a French Architect who has already set up her own practice near Dijon, so she was able to give us a contact for an engineer! 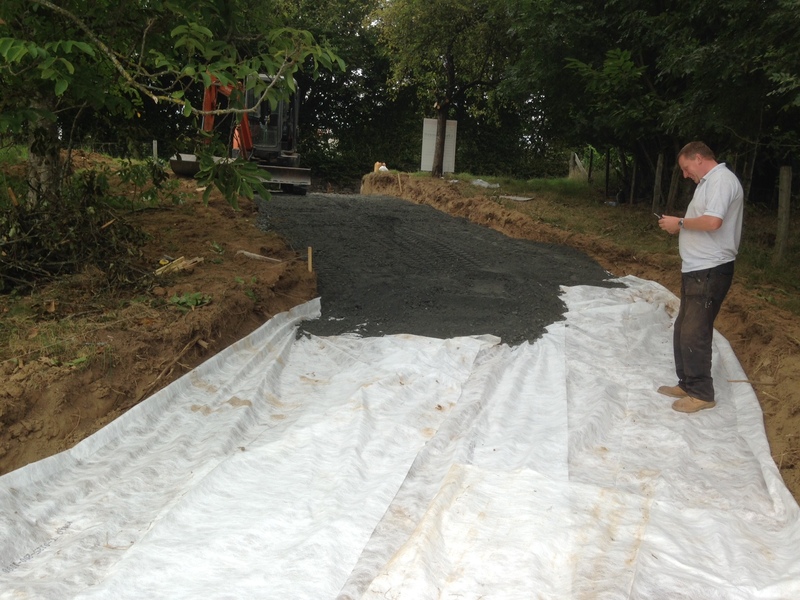 He was very helpful and gave us a lot of ideas of how we could make our house as thermally efficient as possible. Once the application is submitted they have 2 months to let us know if we have been successful or not. If we do not hear with in this time we can take it that we have received tacit authorisation! However, only today did we hear back from the local Mairie informing us that they had received our application on 16th December 2013 – so the countdown to 16th February 2014 starts…. However, they have asked us to show them how we plan to connect to the drainage system and ask that we contact the local ‘technical services’ to discuss the connection work. So once we have confirmed this our 2 month countdown starts. At least this wasn’t a ‘No’! So keep your fingers crossed for us. We would like to thank everyone who has helped us get this far. Naik in Tom’s office for help with the French translation and application form. Also to our good friend Marine at Atelier Zero Carbone Architectes who helped with the process of the French Planning system. She also put us in contact with Athermia who did our Bbio RT2012 thermal calculations. 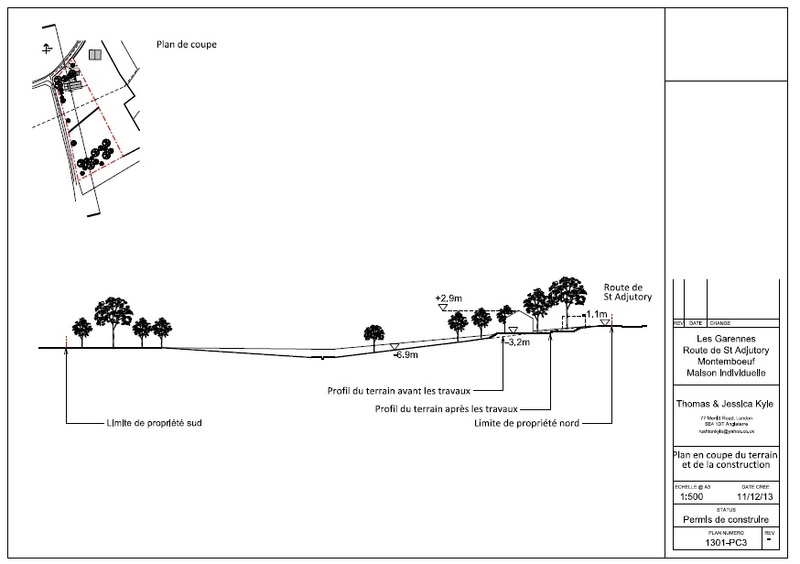 Categories: French Planners, French Planning, Montemboeuf Plot, Planners | Tags: French planning, Planning Permission, Réglementation Thermique 2012 | Permalink.